Why to opt for askIITians JEE Online Coaching Program? What’s different in JEE Main and Advanced Coaching Programs? Online IIT JEE coaching is getting popular among the engineering aspirants. askIITians is a team of 100 ex-IITians who share the passion of guiding and mentoring all students who want to make it to the IITs through JEE coaching. It has emerged as the top online IIT coaching institute in India by designing powerful JEE Main and Advanced coaching programs that help students to score top ranks in JEE Main and Advanced exams as well as their Class 12 board exams. The JEE advanced classes or IIT Online Classes provide a great opportunity for all those who wish to prepare from the comfort and confines of their home. And, those who are looking for IIT Tuition without any add on pressures of travel and overhead expenses. The Joint Entrance Exam (JEE) is becoming increasingly competitive. More than 15 lakh students are expected to register for JEE Main 2018. Only a few thousand students will be able to make it to the IITs. For this, JEE online coaching is a must. IIT JEE online coaching has helped many shape their dream. Students who are interested in IIT JEE online preparation with askIITians get to have the best team of ex-IITians’ coaching and guiding them through their tough journey. Our faculty provides expert guidance for JEE Advanced coaching, through JEE coaching classes. IIT JEE (conducted by IIT Joint Apex Board for admission to all the IITs) has always been considered as one of the toughest entrance tests of the world. AIEEE (which was conducted by CBSE for admission to the Engineering Colleges run by Central Government and 15% quota seats in state-run technology institutes) was one of the largest single-paper entrance exams of the world till it dissolved. IIT entrance exam coaching through online IIT classes is also the perfect solution to affordable coaching. The aspirants are sure to find IIT JEE coaching fees pretty much on the lower side than what is it for regular coaching sessions. However, the expertise of our tutors who are all ex-IITians is unmatched. They are experts at online tutoring, resolving doubts, and uplifting student morale during and beyond the Online JEE Classes. Students can also chat with the tutors to raise doubts or attend doubt removing sessions beyond the scheduled IIT JEE Classes. 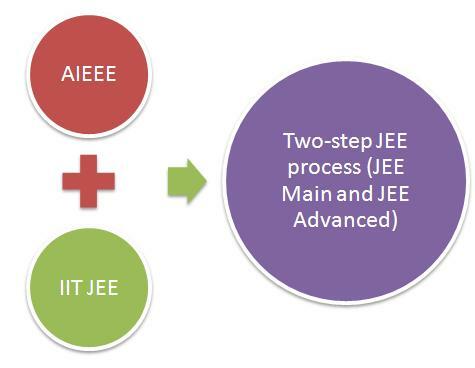 JEE admission process has combined both the tests as the two-step process – JEE Main (new name for AIEEE) and JEE Advanced (new name for IIT JEE) to emerge as one of the largest and toughest entrance exams of the world. JEE online coaching by us makes the syllabus and learning process lucid pertaining to the pattern. States like Maharashtra, Odisha and Gujarat have dissolved their state-level entrance exams and adopted JEE system too, which means they will use JEE Main scores for admission to all the seats in the engineering colleges run by them. Out of about 14,000 students who have made it to IITs in 2017, 478 were from askIITians. This in itself is a testimony to the vitality ofIIT JEE Main and Advanced Coaching Programs it offers. Live Online Classes make high-quality IIT JEE coaching accessible to all students, irrespective of their location and their study schedule. These Live IIT Tuition Classes are offered by highly qualified and competent ex-IITians who have years of industry and online IIT coaching experience. Live online classes of IIT JEE are our specialty. Flexible and interactive IIT coaching programs offered by askIITians allow students to plan academics according to their needs and schedule classes according to their convenience, which is usually after school hours. Additional help is offered to students for board exams and other engineering entrance exams, such as BITSAT, DCE and CETs. askIITians has made a niche in the market for providing the best IIT coaching in Indiabecause it takes care of all the aspects of education of their students. In an effort to offer top IIT entrance coaching programs, askIITians also keep parents in the loop about the performance of their children. Parents Teachers Meetings (PTMs)are organised on a regular basis, where teachers and parents interact with each other and exchange suggestions and feedbacks on how the students can be helped in an optimized manner. One-to-one doubt removal sessions and special classes to help students with their individual problems are also organised from time to time. Now, engineering aspirants do not need to lose sleep over problems they can’t solve. Just tap into the 24X7 Support Systemand get answers to all your queries. Try a free demo class before you take a decision to join askIITians JMA programs. Correspondence Course for JEE Main and Advanced. The links of recorded sessions will be saved in students’ accounts, which they can access whenever they want – even after the course is completed. 18 tests in all – 8 part-syllabus tests and 10 full-syllabus tests. For each test, students will receive AIR prediction and a detailed assessment report. askIITians not only provides best coaching in India but also allow students to tailor their own programs by subscribing just to the individual components of the program they need - Study Material, All India Test Series (All India Test Series), Video Lectures in DVD Format and/or Daily Practice Papers (DPPs). IIT JEE entrance exam coaching needs these ingredients. askIITians JEE Main program restricts itself to covering JEE Main syllabus and helping students achieve highest rank in the JEE Main exam. JEE Advanced program has a slightly different syllabus and exam pattern. JEE advanced online classes will help you climb the ladder. Did you know that you get only two attempts to crack JEE Advanced exam? IIT JEE coaching by askIITians is the answer. JEE Main and Advanced (JMA) programs offer specific help, guidance, tips and tricks for JEE Advanced right after students take their JEE Main exam. These include an intensive Test Series that includes 10 tests based in latest IIT JEE pattern. Each test is a step in grooming you for the actual day of the exam and is followed by a test analysis session, AIR prediction as well as a detailed analysis report that help students find their weak points and recommendations to get over them. askIITians is proud of its exceptional faculty and staff members. All its tutors are ex-IITians with first hand experience of cracking IIT JEE. They have an all-round fundamental and applied knowledge of their subjects, know well about student behavior and thoroughly analyze previous years’ IIT JEE question papers to know about the latest trends of the exam. The study material, assignments, and practice tests are all designed by ex-IITians and IIT Professors, keeping in mind, latest changes in the JEE Main and JEE Advanced exam pattern. Hand-picked after several rounds of tests, all askIITians tutors have at least 6 to 10 years of online teaching experience. They also undergo rigorous training on a regular basis and are rated according the feedbacks of students and parents.